GUIDE: Telling apart good Genesis 1s and Genesis 2s from bad ones. Thread: GUIDE: Telling apart good Genesis 1s and Genesis 2s from bad ones. 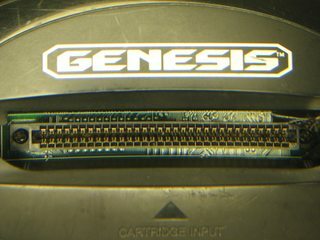 If your Genesis Model 1 shows this screen, it has TMSS, which puts up this screen before playing whatever game you have inserted in your Genesis. If your High Definition Graphics Genesis Model 1 does not show this screen, it doesn't have TMSS. To figure out if you have a non-TMSS High Definiton Graphics Genesis Model 1 or a TMSS High Definiton Graphics Model 1, it's as simple as flipping your console over and taking a look at the FCC ID. Any Genesis Model 1 with TMSS will have a shorter FCC ID. Some people are very picky about whether their Genesis has TMSS or not. 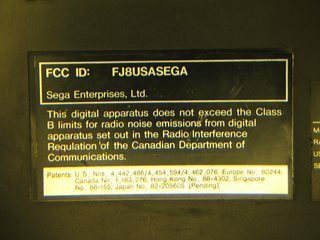 Keep this in mind when looking for a High Definition Graphics Genesis Model 1: there have been several reports of Genesis Model 1s with FJ846EUSASEGA as the FCC ID containing TMSS. 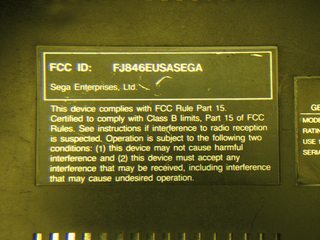 There appears to be a certain production run of Genesis Model 1s with FJ846EUSASEGA as the FCC ID with a motherboard revision containing TMSS. Specifics on these revisions are not known yet. -VA2 to VA5: Clear picture with vivid colors, slightly blurry, but overall very nice. These systems do have what's known as "rainbow banding" where there are thick fixed vertical bars of rainbow colors on the screen, most noticeable on a plain white, plain gray or plain black screen. It varies from console to console, and it can easily be ignored. 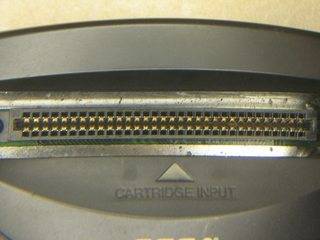 This is typically caused by capacitors that are drying up, so you may be able to completely eliminate rainbow banding by recapping the console. There is also a bit of fringing visible on certain things on the screen (this is when you see rainbow colors on the edges of certain graphics). -VA6: Same as VA2 to VA5 systems, but without rainbow banding. -VA2: Use two separate sound amps/mixers for Mono and Stereo sound. They provide some rather heavy filtering at 3.39KHz, resulting in sound output with a perfect balance of high bass and clean high-ends. Sounds phenomenal EXCEPT when games have loud sound, in which case the VA2 Genesis Model 1's sound output gets crunchy and garbled. With those games, the audio quality could range from perfectly listenable but distorted to downright nasty. The preamp on these boards has its gain set way too high, resulting in this distorted sound. -VA3 to VA6: These boards use the same two circuits as the VA2 board, but with three modifications. The first is the gain on the preamp which has been drastically reduced to fix the distortion induced by the VA2 board's excessive gain. Second, these boards have slightly more muffled sound as their low-pass filters are heavier with the filtering occurring at 2.84KHz instead. Bass is more pronounced as a result. Lastly, the Mono mixing circuit has been changed from a simple buffer to a low-gain amplifier to compensate for the lower gain of the preamp. Click on the following links to listen to audio samples from each of the different motherboard revisions. Samples will be added over time. 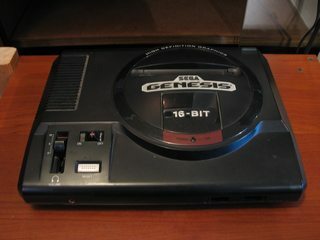 Pretty much as the name describes: a Genesis Model 1 with "High Definition Graphics" removed. Like with the High Definition Graphics model, two variants of the Non-High Definition Graphics model exist, and you must be made aware of how to tell them apart, as one of them is quite a stinker. 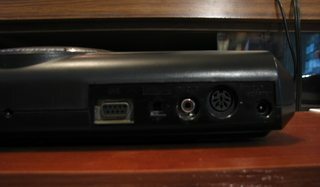 This one has the hookups placed exactly like the High Definition Graphics model, but the hole where the EXT port is supposed to be is covered because the port and all circuitry associated with the EXT port is removed. This is the stinker. Read on to find out why this model is bad enough to be named a "stinker." 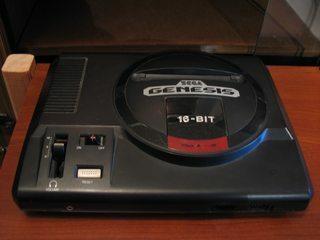 NOTE: There have been reports of non-High Definition Graphics Genesis Model 1s with the EXT port still present. You are guaranteed to get a good system if you find one with the EXT port still present. -VA6, VA6.5, VA6.8: Use the same two sound circuits for Stereo and Mono as the VA3 to VA6 boards in the High Definition Graphics model, which means the sound is just as good. -VA7: Sega changed the sound circuit for this motherboard, and let me tell you, it stinks. Bad. It sounds like an emulator's sound quality was set to the lowest possible setting; it's flat, muffled, distorted, and worst of all, there's an annoying hissing sound in the background (static). Unless you can mod your system with a new audio amp, do yourself a favor and stay clear of this revision. One think to make note of is that the YM3438 in the VA7 Genesis Model 1 has a slightly different sound to it than a discrete YM2612. Due to the altered DAC in the YM3438, games will have varying degrees of differences as the DAC noise in the output is far less pronounced than on a discrete YM2612. It's also less pronounced than the DAC noise on a discrete YM3438 as the ASIC YM3438 eliminates the bit-depth truncation of both the discrete YM2612 and YM3438. Something else that became a trend until the end of the Genesis' life is the use of a second-order low-pass filter on the audio amp. On previous board revisions, the audio circuits have simple first-order low-pass filters, but on later boards, these have second-order filters, which induce heavier filtering than a first-order filter, so if both filters are at the same cutoff frequency, the second-order filter will muffle the sound more than a first-order filter because less frequencies past the cutoff get through. As a result, the audio quality gets degraded, and this issue is exacerbated by the crappy setup of the audio amp. Small note concerning the hissing noise: the amount of hissing in the audio output is fixed out of the Mono audio output at the back of the console and will always be at its absolute maximum, but through the headphone jack, keeping the volume slider below 20% volume will greatly reduce the amount of hissing in the audio output. It still sounds like crap compared to your typical VA2 to VA6.8 Genesis Model 1, but it's much more tolerable. The casing is identical for all variants. 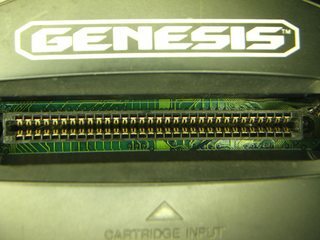 This is a full motherboard Genesis 2; the metal plate is as wide as the console. There are many different motherboard revisions, each with their own variants. 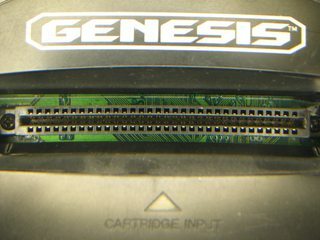 In order to tell the motherboard revisions apart, hold the Genesis Model 2's cartridge slot open and take a look at the motherboard. -VA0, VA1, VA1.8: These use the same sound circuit found on VA7 Genesis Model 1s, meaning that the sound will be just as bad, but the quality varies depending on 2 chips in the console: quad op-amps used to amplify and mix the different sound channels. In general, the sound is worst when LM324 quad op-amps are used, resulting in heavily distorted sound that is sometimes so distorted certain low frequencies come out as squeaks. BA10324AF quad op-amps are the most common ones found on these Genesis Model 2s, which distort the sound, but not as badly as the LM324; essentially, the sound is identical to the VA7 Genesis Model 1, which uses the exact same quad op-amps. The best quad op-amps are the C324G, which do not distort the sound. The sound will still have a hissing sound in the background, however, no matter what quad op-amp is used. And again, the only way to be sure what quad op-amp is in your Genesis is to open it up and look at the motherboard. 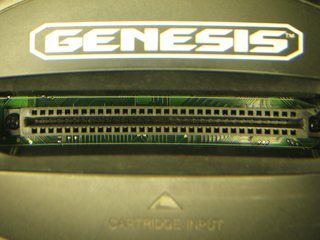 If your Genesis Model 2 contains a VA0, VA1 or VA1.8 motherboard, do yourself a favor and replace the on-board sound circuit by a Mega Amp. It will sound a lot better. Unlike the VA7 Genesis Model 1, the amount of hissing will always remain the same (in other words, at its absolute maximum) as there's no volume slider to control the volume of the audio output. -VA2, VA2.3: The sound circuitry was changed in these motherboard revisions to account for the use of a discrete Yamaha YM2612, which all other Genesis Model 2 motherboards lack. The quality of the sound has greatly improved, but it's still not perfect. The sound no longer has a hissing noise in the background, but there are some volume balance problems with both motherboards. The main problem is that the sound coming off the YM2612, FM Synthesis, is too loud. This makes Genesis games that use PSG sound off, and speaking of PSG, it's pretty bad on both the VA2 and VA2.3 motherboards. There are 4 PSG channels in the Genesis: 3 square waves and one white noise. Two of the square waves are too quiet, causing Genesis games that make heavy use of those square waves to sound wrong. This is especially noticeable when playing Sega Master System games on a Genesis Model 2 that contains either motherboard as the sound will be off and heavily distorted. 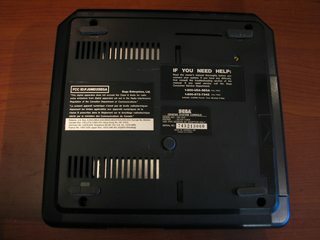 Sound coming off a Sega CD (PCM and CDDA) or Sega 32X (PWM) is also too quiet due to the YM2612's sound output being too loud. Also, due to the continued use of a second-order low-pass filter, the audio is more muffled than it should be on VA2 and VA2.3 boards despite having none of the major hissing that plagues their predecessors. The reason why the PSG is screwed up on both the VA2 and VA2.3 Genesis Model 2s is because the PSG is not wired correctly into the mixing circuit. PSG on the Genesis requires a pull-down resistor before anything else in the circuit, but on the VA2 and VA2.3 boards, there is a series resistor prior to the pull-down resistor, which creates a voltage divider. This is wrong and causes distorted PSG because there must be a pull-down resistor first, then whatever else is needed for the audio circuit. 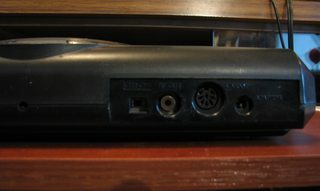 The metal plate ends further from the edge of the console than the full motherboard Genesis Model 2s. This means the motherboard is shorter, hence 3/4 motherboard. These are generally superior to full motherboard Genesis Model 2s out of the box, though they're harder to find. To tell the two boards apart, look for two square cutouts on the metal plate. If the cutouts are absent like on the console pictured above, it has a VA3 board in it. If the cutouts are there, it's a VA4. There are two different variants of the VA4, one made by Sega with the usual model number of MK-1631 and one made by Majesco with a different model number of MK-1451. -All motherboards: A further revised sound circuit on these motherboards produces sound almost as good as a Genesis Model 1 that's got a VA2 to VA6.8 motherboard, but more muffled due to, once again, a second-order low-pass filter. The volume balance problems have been fixed on these motherboards, but the filtering is uneven between FM Synthesis and PSG, resulting in some weird PSG at times. A note regarding VA4 boards: these use a GOAC YM3438 which has a further modified DAC to make the DAC noise even less apparent than on any other YM3438 variant or the YM2612. 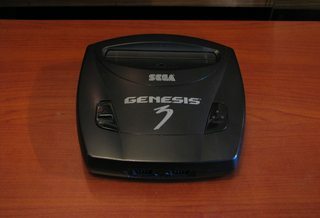 Like the Genesis Model 2, the casing is identical for all variants. 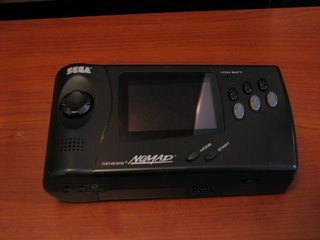 This model has some compatibility issues, which includes Virtua Racing, the Sega CD, the Sega 32X, the Game Genie and any game that exploits improper implementation of TAS instruction in the Genesis (Gargoyles in particular), which the Genesis 3 fixed. 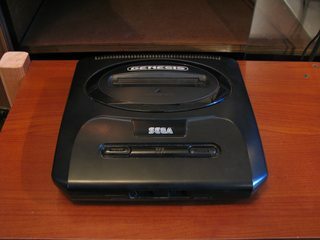 Compatibility fixes do exist, but performing them is rather difficult, and only one motherboard revision has been modified to the point of restoring all compatibility excluding the Sega CD and games that exploit improper implementation of TAS instruction. One way to determine what motherboard is in your Genesis 3 without opening it up is to try playing Virtua Racing on the console. 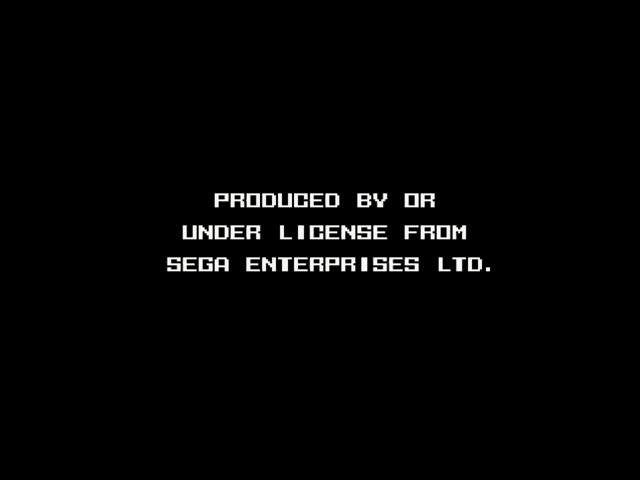 If the PRODUCED BY OR UNDER LICENSE FROM SEGA ENTERPRISES LTD. screen shows up, you've got a VA1 motherboard. If you try to play Virtua Racing on a Genesis 3 with a VA2 motherboard, you'll just get a black screen. Of those two boards, the VA1 board is where all compatibility fixes can be performed. As of right now, only the Game Genie and Virtua Racing can be made compatible with the VA2 board. -The Composite video out of the Genesis Model 3 is simply beautiful. It's even sharper and brighter than Genesis Model 2s with a CXA1645, though depending on your TV's settings, the TMSS screen might be a bit smeared and the edge pixellation may be pretty bad. This is true of both the VA1 and VA2 motherboards. -VA1: Because the Genesis 3 is a cut-down Genesis, the sound circuit was revised to only output Mono sound, so you will not get any Stereo out of the Genesis 3 unless you replace the on-board sound circuit or send, for example, the LEFT audio output to the existing sound circuit and replicate the circuit for the RIGHT audio output. The quality of the sound doesn't suffer very much despite the revised circuit. In fact, the sound is clearer than any Genesis Model 1 or Model 2 with the usual evidence of a second-order low-pass filter, however, the bass is a little weaker on the VA1 Genesis 3 than other models of the Genesis. It's like there's a bit of high-pass filtering going on. There's also a minor amount of hiss in the audio. -VA2: Like the VA1 motherboard, the audio is in Mono only and will only output Stereo sound if you modify the console. Overall audio quality is very close to the VA1 motherboard, but the bass is slightly heavier and PSG is slightly louder than normal. This works better for Mono audio as on earlier consoles, PSG would be drowned out a little bit when Mono sound used. The hiss from the VA1 board is not present here. As far as I'm aware, there exists only one motherboard revision of the Sega CDX, and it's generally quite good. Read on. -The video is sharp, but does exhibit some edge pixellation on certain graphics. The video is also darker and more saturated than other Genesis systems. -The sound circuit used on the CDX is made in such a way that the sound produced is rather weird. The sound has some slightly weak bass and has noticeable evidence of a second-order low-pass filter as although the filtering is weaker than normal, the audio quality is noticeably degraded. The sound output of the CDX is also quieter than other Genesis systems and the sound produced by the ASIC YM3438 is too loud. There's also some bass-boosting of sorts going on in the headphone jack as the bass is noticeably stronger out of the headphone jack than either the A/V out or the Line out, but the rest of the sound is unaltered. Being as only 1 million of these things were ever made, only 1 motherboard revision exists. -While the built-in screen on the Nomad isn't of very high quality, the Composite video of the Nomad is really nice. It's on the same quality level as non-VA3 Genesis Model 2s with a CXA1645, but with absolutely zero fringing. -The Nomad uses a completely different sound circuit from the Genesis home consoles due to the fact the Nomad is a portable. The audio out of the on-board speaker is clear, but is very quiet and generally not all that good with almost zero bass and overall poor quality. The TV out, on the other hand, produces very similar sound to the pre-VA7 Genesis Model 1s, but more muffled. The big problem with the Nomad, and it may just be my Nomad, is VERY loud background noise in the audio output, both on the TV out and headphone jack. 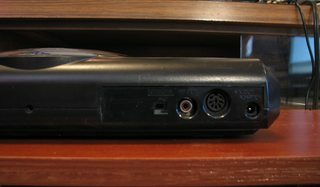 The overall sound is the same on both the TV out and the headphone jack except the headphone jack produces louder sound and is even noisier than the TV out (hissing plus electrical noise). PSG is also slightly louder on the Nomad. Do take note that the Nomad, like the Genesis 3, has compatibility issues. 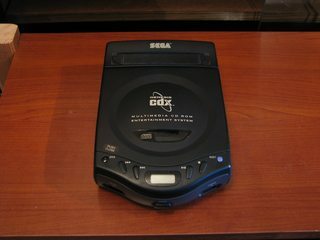 Of course, since it's a portable Genesis, it can't be hooked up to a Sega CD. The Nomad is also unable to work with Sega Master System converters and the Sega 32X, but unlike the Genesis 3, it will play Virtua Racing. Compatibility fixes do exist to make the Nomad compatible with Master System converters and the 32X, however, it is advised not to bother with the 32X mod since you will not get the 32X's video layer on the built-in screen, only on a TV (unless the Nomad is your only Genesis. Just don't expect 32X gaming on the go). 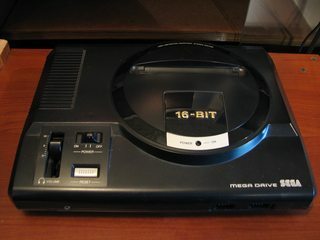 Like with the High Definition Graphics Genesis Model 1 in North America, the AV Intelligent Terminal/High Grade Multipurpose Use MegaDrive Model 1 in Japan has two different variants, but unlike the High Definition Graphics Genesis Model 1, neither model has TMSS. 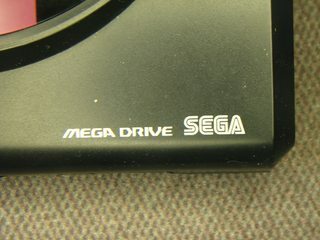 That is the earliest model of the MegaDrive, the Japan-only model. That's the first of the all-Asia NTSC models. -VA5: Like all North American Genesis Model 1s, the picture is bright and colorful, but slightly blurry. There is also a very slight instance of rainbow banding on the VA5 motherboard in the MegaDrive Model 1. -VA0 to VA2: Use the same Mono and Stereo audio amps as the VA2 Genesis Model 1s in North America, so the sound will be clear with very high bass and is prone to distortion with loud games due to excessive gain on the preamp. -VA3 to VA5: Use the same Mono and Stereo audio amps as the VA3 to VA6 Genesis Model 1s in North America, so the sound will the same as those - clean, bass-heavy and slightly more muffled than the amp on the VA0 to VA2 boards, but distortion-free. This is when TMSS was introduced into the MegaDrive Model 1 in Japan. 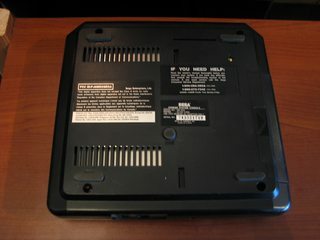 If you find a Japanese MegaDrive Model 1 without AV Intelligent Terminal/High Grade Multipurpose Use written on the case, it's guaranteed to have TMSS. -VA6, VA6.8: Use the same Mono and Stereo audio amps as the VA3 to VA5 AV Intelligent Terminal/High Grade Multipurpose Use boards, so the sound will be clear and with very high bass, though slightly more muffled than the VA0 to VA2 boards. -VA7: Just like the VA7 motherboard revision in the North American Genesis Model 1 - hissy, muffled, distorted and generally very poor sound quality. 1) They run in PAL and most games are not PAL-optimized, so they'll run slower than normal and the picture will be letterboxed. 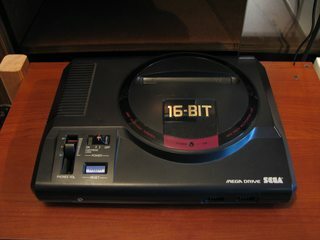 2) Due to a slower master clock on European MegaDrives, every component in the system runs a bit slower than it should, and this affects the sound. Read on to find out how. -VA6: Oddly enough, Composite video looks better on a PAL console than on any NTSC Genesis or MegaDrive. There's no rainbow banding or fringing and the colors are very vibrant, but the video overall looks blurrier than on an NTSC Genesis or MegaDrive. -All motherboards: Again, these use the same Mono and Stereo audio amps as the VA3 to VA6.8 Genesis Model 1s in North America, so the sound will be clear and with very high bass, however, due to the slower master clock, the sound pitch is overall lower than on any other NTSC Genesis or MegaDrive. 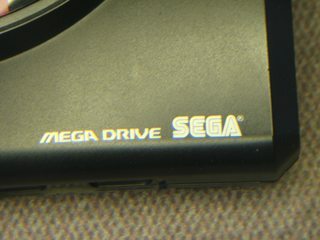 Self-explanatory: a MegaDrive Model 1 without High Definition Graphics - Stereo Sound printed on the case. These models are guaranteed to have TMSS. -VA6.5, VA6.8: Use the same Mono and Stereo audio amps as the High Definition Graphics - Stereo Sound model, so the sound will be identical to that model. -VA7: Just like the VA7 motherboard revision in the North American Genesis Model 1 and Japanese MegaDrive Model 1, expect hissy, muffled, distorted and generally very poor sound quality. Non-High Definition Graphics - Stereo Sound image courtesy of Socram8888. That's the general rundown of nearly all Genesis and MegaDrive models. Feel free to contribute extra information concerning any and all hardware missing from this guide. Update June 25, 2017: Some users have reported finding VA6 boards inside non-High Definition Graphics Genesis Model 1s, EXT port and all. This extra information has been added to the guide. Last edited by Ace; 06-25-2017 at 01:12 AM. Good guide. I have the Model 2 (VA4 revision) with the CXA1645 encoder. The sound is very good and modding it for S-video is very easy. I think I'm gonna have to upgrade speeds through my ISP before I visit this thread again....12 pics @ 2272px × 1704px, wow. That's what happens when you don't have a damn clue how to put pictures as thumbnails WITHOUT using the Attachment feature. I should resize my pictures in my future posts. @Xbrinkx: Very nice, very nice. I'm sure yours didn't go through all the hell my VA4 did: failed attempt at turning it into a Neptune, broken trace, leaking capacitors, system instability, consistent resoldering... it was HELL! Took me 3 months to get it working properly again, and I took the opportunity to add a US/JAP region switch and S-Video. 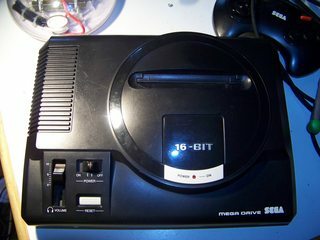 My mothers Mega Drive does not appear in any of those pictures, going by the cart slot. I'm sorry for my DSi being unable to take a high enough resolution screenshot, but I took it in the best conditions possible. Taking apart the Mega Drive is out of the question, Mum would be worried I'd break it or something, but I can tell you that the video via RF is not half bad (Apart from the obvious issues with the RF unit blurring it a bit and introducing interference), but I am able to tell the pixels apart, probably even more so via the composite cable. Anyway, the cart slot is significantly different from your images shown. Also, the sound is nothing to write home about, probably one of the worse model 2's I've experienced, the one at my house is much better... or it could be the RF module, who knows. I wish I had my composite cables on me. @Kool kitty89: The simple S-Video mod on the CXA1645 is just a 75ohm resistor on both the Chroma and Luminance lines. @Flygon: Full motherboard, bad sound, cartridge slot doesn't match any pictures... sounds like a VA0 motherboard revision to me. 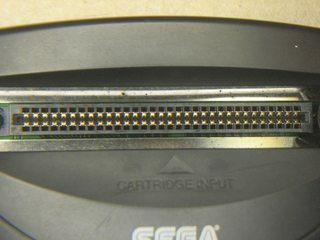 Flygon, would you be able to take a clearer picture of the entire cartridge slot of your mother's VA0 MegaDrive II under brighter lighting conditions? I'll add the picture to the guide. The capacitors aren't really necessary. I didn't use any, and the S-Video works perfectly fine. Hmm... very well. Once I get some extra capacitors, I'll add them in. May I ask why they're needed? It allows me to confirm once and for all that yes, I do have the dreaded Genesis Model 1 with a VA7 motherboard!